Starting in Nairobi Kenya we spend the first week trekking in and around Mt Kenya and ascending 17,00ft Point Lennana to acclimatize. After a brief stop in Nairobi we continue to Kilimanjaro , 19,340 ft. and ascend this giant volcano in 6 days. 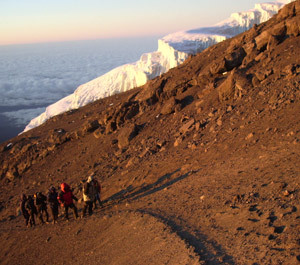 There are many different routes on both Mount Kenya and Kilimanjaro, from easy walk-ups to technical ice and rock. The itinerary can be modified to suit your level of expertise. Possible routes include the Ice Window or Regular route on Mt. Kenya and the Heim Glacier or any of the non technical routes on Kili. The final week is spent on a land rover safari in Tarangire, Ngorongoro Crater and Lake Manyara National Parks, where we see leopards, elephants, rhinos, lions, giraffes etc… on the awe inspiring plains of Africa.